Aerial view of the station. The IITA-Abuja Station continues to be transformed with the addition of new structures as recently outlined by the Head of Abuja Station, Gbassey Tarawali. In his presentation, given during the visit of IITA Board of Trustees Chair Dr Amos Namango Ngongi on 15 January, Tarawali highlighted the remodeling of old residential houses into ultra-modern office spaces. Construction of a new office complex was undertaken to meet the needs of the increasing number of scientists and other staff in the station. 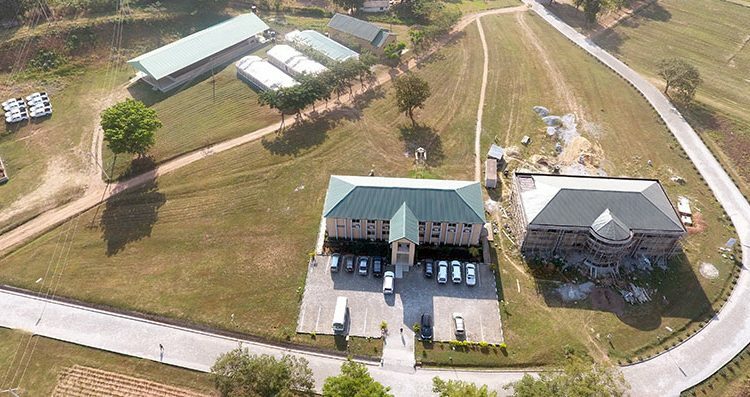 Related to office accommodation was the construction of a standard, well-furnished guesthouse to serve the lodging needs of visitors and scientists at the Station. This seven-bedroom guesthouse now serves an escalating clientele of outstation staff of IITA and partner institutions. To improve the security situation of the Station, a perimeter fence has also been constructed on the porous south wing border of the premises. This re-enforcement replaced the old, dilapidated barrier earlier erected by the Federal Capital Territory Administration (FCTA). The road network within as well as the main access road to the Station also received a facelift. In addition, a diesel dump and a 250kva power generating plant were installed to support smooth business operations in the Station. From a single screen house and yam barn, support for research and development activities in the Station has been tremendously boosted with the construction of a mega-sized yam barn and three additional screen houses. 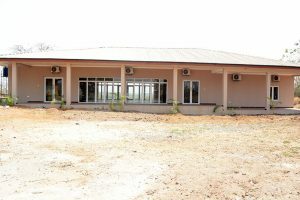 These new facilities heavily support the yam breeding unit of IITA. In addition, plans have reached an advanced stage for upgrading and modernizimg facilities at the old crop processing center to support the biotechnology and genetics resource needs of scientists working on crop improvement in the Station. Presently, the following projects are implementing activities in the Station: ATASP-1, AfricaRice, AgResults, aTTC, N2Africa, AfricaYam, YIFSWA, IYA, Cassava Program, Maize Program, HarvestPlus, and Cowpea Program. In line with IITA’s strategic vision for the Abuja Station as a Center of Excellence for Agribusiness and Youth Development, a large warehouse to support the seed sector of the North Central agroecological zone was constructed under the former SARD-SC Project. The approximately 271.16 m2 seed warehouse will serve the purpose of housing improved seed and planting materials. While paying attention to the revamping of infrastructure in the Station, the welfare and wellbeing of staff was also given adequate consideration by converting a section of the driver’s lodge into a crèche and the employment of an attendant to care for the increasing number of infants of staff in the Station. In addition, an ultra-modern canteen has just been completed with the capacity to serve over 200 members of staff. At present, 153 staff are working in the Station. While tremendous progress has been made in the development of infrastructure in the Station, key challenges still exist including the completion of perimeter fencing to support the Station’s security architecture and the installation of underground tanks for the storage of petrol.